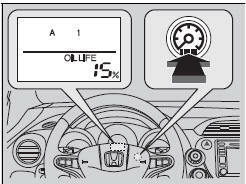 If the engine oil life is less than 15%, you will see the Maintenance Minder messages appear on the information display every time you turn the ignition switch to ON . The messages notify you when to change the engine oil, or when to bring your vehicle to a dealer for indicated maintenance services. 1. Turn the ignition switch to ON . repeatedly until the engine oil life appears on the information display.
) stays on in the instrument panel after the engine oil life becomes 0%. Have the indicated maintenance done by a dealer immediately. 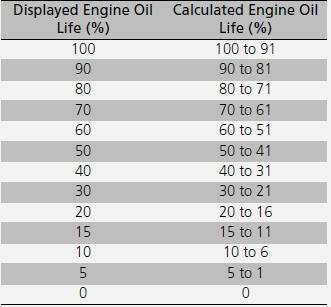 Based on the engine operating conditions, the remaining engine oil life is calculated and displayed as a percentage. *1: If a message SERVICE does not appear more than 12 months after the display is reset, change the engine oil every year. *2: Canadian A/T models only # : See information on maintenance and emissions warranty. *3: If you drive in dusty conditions, replace the air cleaner element every 15,000 miles (24,000 km). *4: If you drive primarily in urban areas that have high concentrations of soot in the air from industry and from diesel-powered vehicles, replace every 15,000 miles (24,000 km). • Independent of the Maintenance Minder information, replace the brake fluid every 3 years. • Inspect idle speed every 160,000 miles (256,000 km). • Adjust the valves during services A, B, 1, 2, or 3 if they are noisy. 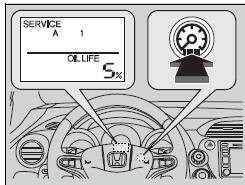 Reset the engine oil life display if you have performed the maintenance service. 2. Display the engine oil life by repeatedly pressing the (select/reset) knob. ► The engine oil life indicator and the maintenance item codes blink. ► The displayed maintenance items disappear, and the engine oil life display returns to 100%. Failure to reset the engine oil life after a maintenance service results in the system showing incorrect maintenance intervals, which can lead to serious mechanical problems. 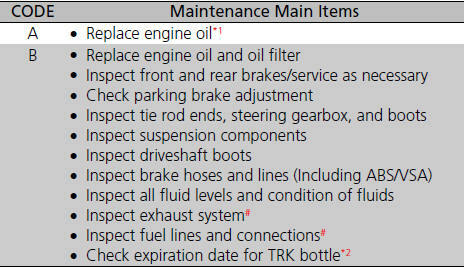 The dealer will reset the engine oil life display after completing the required maintenance service. If someone other than a dealer performs maintenance service, reset the engine oil life display yourself.